Akriti Khatri’s angular body darts from one room to another. She’s either on the phone, attending to a client, or asking a young assistant to do background research on a potential target. Khatri is 5ft, 7 inches tall and is wearing a raven-hued knee-length coat pinned at the waist. She doesn’t carry the reserve one would expect investigators to harbour—she’s not guarded, or suspicious. Rather, she is warm and amicable, but also oddly distant. Khatri meets me on a cold January afternoon with a wry smile, and is willing to answer most of my questions. She barely pauses between sentences to catch her breath. The 33-year-old owns Venus Detectives, a pan-India investigative service she has been running since 2011. Over the last eight years, it has spawned mini-offices in Mumbai, Bengaluru, Hyderabad, Kolkata—“Think of any major city and we are there," she laughs. Geographically, her head office is located in Noida, Sector 4 (Uttar Pradesh). Logistically, it might take you longer than you’d imagine to get there. You have to drive through roads that frame a straggle of buildings in a semi-industrial, semi-residential area, packed with slow-moving cows and jaywalking vendors with their vegetable carts. The agency is tucked away in an industrial building. When you reach the third floor, there are no signs or nameplates to indicate that you’ve arrived at the right spot; all you get is a large, unmanned glass door. The office is spartan, with bare walls, a few faux-leather chairs, tables and less than a dozen desk computers thrown in. Even Khatri’s lair gives away nothing about her taste—nothing like a stack of books to signal her reading interests, a wall-hanging, a plant or a framed photograph of her family. Instead, there are tiny figurines of the Hindu deities Ganesh and Lakshmi, huddled next to a small shrine on her shelf, along with two trophies. On her table, alongside her laptop and spectacles (which I later learn is embedded with a tiny camera), is a wooden pencil stand with the words “Good luck" engraved on it. It is as though Khatri doesn’t want to dole out clues about who she is—apart from informing her clients, many of whom belong to conservative households, that she is god-fearing. Khatri began her career as a detective 12 years ago. In school, she had been dubbed a khabri lal (someone with a penchant for gossip) by her friends. When she graduated from Zakir Husain Delhi College (with a background in zoology, botany and chemistry) in 2007, she applied for an MBA and a three-month course in forensic sciences and handwriting analysis at Delhi University. The same year, after reading a “detective services" advertisement in a newspaper, she joined a hole-in-the-wall investigating agency (which she doesn’t want to name) in the city. It was a gutsy career move, particularly because this industry is traditionally male-dominated, but one she would stick to. At that time, Khatri was the only woman field agent other than the five male investigators in the firm. “Even today, you can count female detectives in India on your fingers," she says. “Most women are not ready to do it. Most families are not letting their daughters do it. It is a challenging profession, especially when there are cases which involve late night surveillance." Her parents, however, were quite supportive, she adds—which is why she is still in the business. Most of the cases her agency receives are the usual suspects: infidelity, pre- or post-marriage investigations, corporate fraud, and, very rarely, murder cases. For Khatri, the profession is a lucrative business. She charges ₹6,000-7,000 (or higher, depending on the case) per day. At present, there are 50 investigators across India at her agency, and among them “15-16 are women". To be a successful investigator, one has to master anonymity: the ability to mingle with a crowd and recede into the background, observing hawk-eyed and waiting patiently. It is a practice strangely akin to the act of predation. Khatri never hires operatives who are unique in appearance or stand out easily from the crowd. “We need common-looking people. They have to be simple in their dressing, simple in the vehicle they drive, and shouldn’t have anything clunky on them, like a big camera and anything," she lists, counting each point on her fingers. There is nothing striking about Khatri’s appearance either. She wears her hair open, pinned partially by a clip at the back, has no make-up on, and the only items of jewellery are a small pair of earrings and two delicate gold bands on her fingers. “Being a female, people trust you easily," she continues. You might pause to disagree with Khatri here, but in India, when it comes to weighing in on whether an unknown man or woman would raise a greater degree of suspicion, the common perception swerves towards the former. “People are willing to talk to women more easily because they don’t pose a potential threat. Of course, you should look presentable. It’s all about how you carry yourself, you have to have confidence, and you have to be quick to think on your feet," she explains. There is something deeply troubling that strikes me during our conversation. In India, it seems that operatives are able to enter a majority of homes belonging to unsuspecting targets and cull large chunks of information without showing their credentials (like pulling out a business card or identity proof). For instance, Khatri says that investigators are said to have walked into houses posing as government representatives taking a census survey or as bank representatives offering loans, to assess the number of people living in a family or their financial stability. This kind of intelligence is gold for pre-marriage investigations. Taralika Lahiri, who runs her own independent agency, National Detectives and Corporate Consultants, has been in the field for the last 30 years. 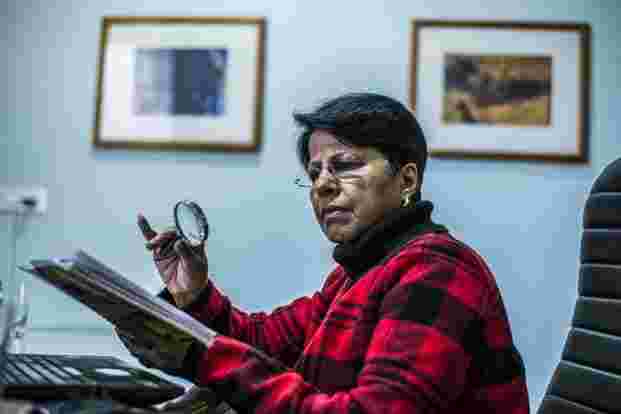 Over 60 years old, Lahiri is a no-nonsense woman, sporting a short bob cut and rimless glasses. She believes she is one of the first women investigators in India—her first assignment dates back to 1989. From being handed out cases as insignificant and absurd as locating a missing domestic cat, to graduating to solid, high-profile investigations that included tailing a liquor baron for an alcohol manufacturing company, Lahiri has lived it all. “I come from a small city called Allahabad (now Prayagraj) in UP. It was in 1987 that I shifted to Delhi. Back then, I didn’t know what a detective agency was or that such a job even existed," Lahiri tells me one January afternoon, while seated in her office in south Delhi. After shuffling through a few jobs, including trying her hand at teaching for a year, she finally joined an investigating firm in January 1989. “I still remember, it took me months before I told my husband (an engineering consultant) what I was doing. He was supportive; however, he asked me to be cautious." The firm (which she does not wish to name) was a small, nondescript office in Nehru Place manned by 15 male investigators. Lahiri stood out. “There were women working there, but they were all secretaries and receptionists. I was the only one who went on field assignments," she recalls. Over the next few years, Lahiri would go on to take up certain opportunities which weren’t necessarily part of her job profile. For instance, there was a time when the Delhi branch did not have a head manager for months—Lahiri stepped up to fulfil that role, even though she wasn’t asked to. “I had to work hard to prove myself. I remember that men who had to report to me didn’t like it. They didn’t appreciate my authority." Having colleagues barge into her cabin, demean her and hurl phrases like “We won’t let you continue like this!" was an ordinary day at work for her. “There were investigators who would go into the field, come back and submit their reports. And I could make out that they weren’t providing me with the correct information in those reports. Often my colleagues would suspect that just because I am a woman, the bosses liked me more." After working diligently for six years, when Lahiri asked her employer for a promotion, it was politely declined. “I was told that my colleagues wouldn’t accept it and they may have further problems in the company because of that. Eventually, I was told that I was ‘still not very mature’ in the field," she says, folding her arms. “Till the time I was doing everything quietly, it was okay. But when it came to promoting me, I wasn’t given a promotion. This was why I left." Lahiri went on to start her own private investigation service in 1995. “I had the phone numbers of clients who knew me very well from my earlier cases. I informed them that I had left my previous job, and was now working on my own. I got a very good response from them. A lot of people said, ‘You were the eyes and ears of that firm.’ So my company took off really well." Today, Lahiri is an elected board member (the only woman out of the 19 Indian investigators at the World Association of Detectives (WAD). The association is one of the oldest and most reputed international detective networks, with 1,000 members across 180 countries. Lahiri was also the founding member and vice-chairperson of the India-based Association of Private Detectives and Investigators (Apdi), but she recently left Apdi for reasons she does not wish to cite. “If I had to choose between a male and a female investigator, I’d say a woman is way better than gathering information," says Sujeet Menezes, a WAD board member and director at IBI Group Inc., a Mumbai-based investigating agency. “We’ve had some really good women investigators in the past who’ve solved some really big cases. Unfortunately, they’ve left the field." Menezes mentions that most women leave the profession because they lead hectic lives bookended by household chores and family responsibilities. “For men in India, these familial demands do not matter. Our Indian culture is such." Here’s the kicker: Private investigation isn’t a licensed profession in India. The Private Detective Agencies (Regulation) Bill, 2007, is still with the parliamentary committee. “Our job lies in a grey area," says Menezes. “It’s not legal and it isn’t illegal either. There have been a lot of blackmailing cases, where freelance investigators or companies have indulged in unethical activities. So, there is no law to regulate the operations of such firms. Personally, I feel they should legalize the profession, so that such unwanted scenarios are avoided." While Lahiri had to navigate rocky terrain three decades ago, things have been comparatively less tumultuous for women who want to choose this profession today. Delhi-based Tanya Puri, 25, for instance, was trained by her father, Baldev Puri, 53 (who runs his own detective agency, AMX Detectives, and is the deputy general secretary of Apdi). Tanya is the CEO of Lady Detectives India, which offers investigating services across the country. “We have 300-350 investigators across India, out of which 70-80% are women," she says. Her first case came to her when she was still in college. She was 20, studying mass communication at the Indraprastha College for Women, Delhi, when her father asked her if she could help him on a case. “It was a Delhi University case itself. My job was to follow another girl who was studying at Miranda House," she says. We are seated in her first-floor office at Delhi’s Bhikaji Cama Place, a thriving commercial hub. “This girl would disappear during college hours," continues Tanya. “Her parents had seen a general change in her behaviour and had found unusual clothes at home. I had to find out where this girl went during the day, whether she had a boyfriend or anything. On the surface of it, it all seemed quite simple." It was an assumption Tanya would learn not to make again. “My father thought that I would be perfect for this job, because I was still a student and would easily be able to blend into the college crowd." After getting briefed and prepped for about a week, Tanya began tailing her target. Within the first week, she found out that the woman, in fact, worked part-time at a brothel on GB Road, a red-light district. In a predatory city like Delhi, notorious for its deplorable safety standards for women, however, what happens to investigators who have to go undercover for a night surveillance job? “We do have men working with us at night as well," explains Tanya. “They might not be right there in the field, but they are there around in the background. So that in case we need some sort of an SOS system immediately, we have it." Like the time when her firm trained a female operative to go undercover as a dancer at a bar for a sensitive, high-profile case over two years ago. “To get into someone’s routine and pretend that you are a part of that community is not an easy job and it takes a lot of time. But at the same dance bar, we had our men who served as waiters to remain alert and ensure that our undercover agent wasn’t exploited in any way," she explains. The services at Lady Detectives India start at ₹5,000 per day. If it is an undercover project, however, which could potentially last for months, clients are willing to pay over ₹2 lakh per case. Tanya refers to her tight-knit tribe of women investigators as her “Girl Squad". According to her, more and more young women are showing interest in this field—she receives at least six-seven resumes every week. “Times are changing. Women are equally capable of doing a good job as investigators. My team is proof of that and I’m quite proud of them."